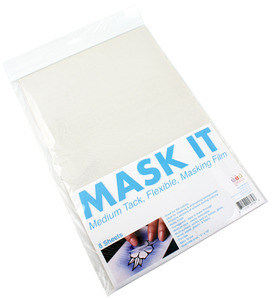 Mask It is a new product from the makers of Copic Markers, it’s an adhesive backed film that is easily cut or punched to be layered over your stamped images for easy masking techniques or when using colored sprays or airbrushing with your Copic markers. The best thing about it is it’s totally clear so it’s easy to position exactly where you want it! It can be found here at Taylored Expressions and also here at All that Scraps.